Last Thursday’s signals were not triggered, as unfortunately the bearish price action took place a little way above the resistance level identified at 1.3332. Trades may only be entered between 8am London time and 5pm New York time today. Go long after the next bullish price action rejection following the next touch of 1.3241 or 1.3204. Take off 50% of the position as profit when the trade is 20 pips in profit and leave the remainder of the position to ride. Go short after the next bearish price action rejection following the next touch of 1.3352, 1.3369 or 1.3389. I wrote last Thursday that the picture was bearish and that if the price broke below 1.3285 during today’s session on higher than average volatility, I would take a bearish bias on this currency pair, especially if it happened during the New York session with Crude Oil trading at new higher highs. As it happened the price never got below 1.3285, and actually rose at the end of last week to break the former bearish trend line and test the area of resistance which can still be seen in the chart below, so that was a good call at least insofar as 1.3285 was a reasonably accurate pivotal level for the day. There has been a lot of activity in the Canadian Dollar. The price has turned bearish again, and the price chart below shows it is possible to readjust the bearish trend line into two lines which are confluent with a cluster of resistance levels between 1.3350 and 1.3390. The current price action is bearish and there is no support before 1.3241. However, there are swing lows close to 1.3285 so I would want to see that level broken down on above-average volatility before turning bearish, just as I did last Thursday, until the 1.3241 level is reached. 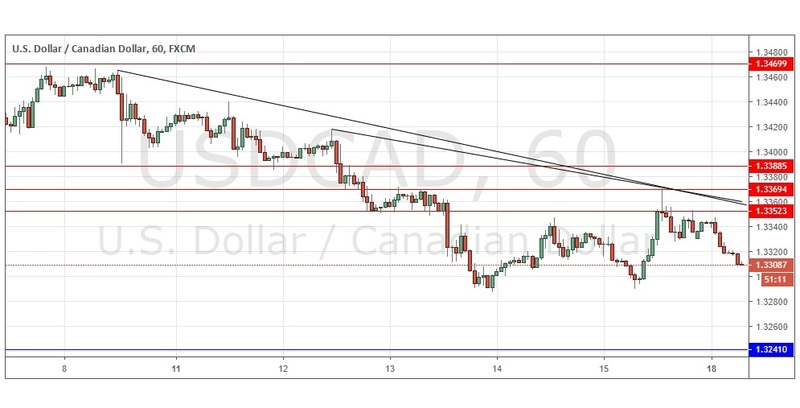 There is nothing of high importance due today concerning the CAD or the USD.